Just how is it that a single driver with less than five years in Formula One was able to dominate the field in such a devastating way in 2011, a field which includes drivers like Lewis Hamilton and Fernando Alonso? It’s his brains. 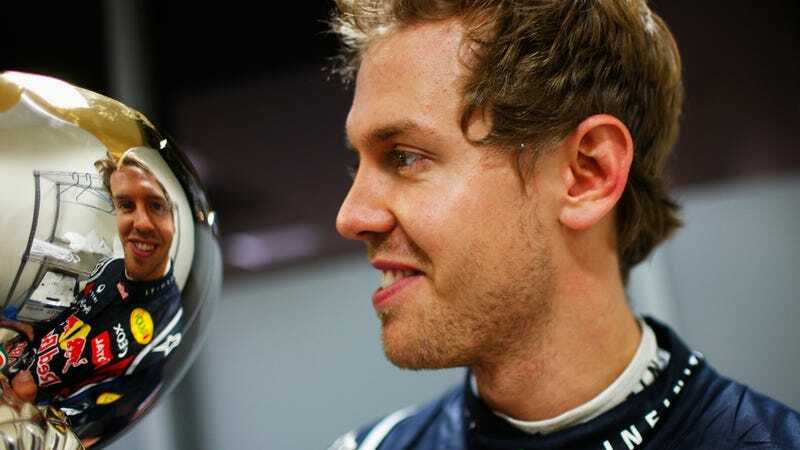 In his article “Assessing the top five F1 drivers at the end of 2011”—which, contrary to the title, is about Sebastian Vettel—the BBC’s Mark Hughes makes the case that Vettel’s dominant season is mostly explained by his intelligence, and the way he’s used it to adapt to the new Pirelli tires and the tricky Red Bull car. The rear Pirelli tyre is less tolerant of slip angle (being slid rather than merely cornered) than the Bridgestone. It has a very stiff construction—because being new to F1, Pirelli wanted to ensure a safe tyre above all else—and that means it does not like being asked to transfer lateral and longitudinal load at the same time, ie braking or accelerating while also cornering. So there is less ‘give’ in the construction to bridge the gap between the two types of forces. The combination of stiff construction with soft compounds (introduced to spice up the racing) means that the tyre’s performance drops off very quickly, as without much help from any flexing of the tyre’s structure, the compound gets abused and overheats. Managing tires during qualifying and the race was a major component of the way he built up such a massive margin in the first half of the season. Earlier this year team boss Peter Sauber was reflecting on how he and BMW had relinquished Vettel back to Red Bull too easily when he was their reserve driver in 2007. His brains were needed to get the most out of Adrian Newey’s Red Bull RB7, a car which the equally fast Mark Webber managed only three pole positions and one win with. [The RB7 is] a car with devastating performance but not very raceable on account of lack of straight-line speed and a weak Kers power-boost system. That is one very tricky package to maximise. It must be qualified on pole, not lose the start and be out of range of a car that could use its DRS overtaking device by the end of the second lap. Thereafter you must use its performance sparingly, otherwise your tyres degrade faster than those of the slower cars and you must have enough life left in the tyres at the end of the stints to be able to turn it on for a very fast in-lap to respond to the guy that’s stopped before you and has got onto fresh tyres. That is a combination that needs a lot of mental dexterity in addition to sheer skill. It’s not only about being fast. Everyone who drives a Formula One car for a living is ludicrously fast. If you’d put any of the 24 drivers racing in Formula One in the RB7, he would probably get very close to Vettel’s pole position times within a few hours. But can you think about your tires while you’re driving that one lap? Can you think about the entire car and pick up details about the way it behaves that can be used by the engineers as feedback to develop car? Can you do this in a race? Can you do it in a race where the pressure is on you to perform? Can you think about your fuel load while you’re doing that? Can you do it for an hour and a half? Can you do it in the rain? Can you do it on a track which is half wet, half dry? Can you do it on a day where you don’t particularly feel like doing anything? Can you do it every other weekend between March and November? Can you stay after the race and go over pages and pages of data for hours? Can you do it for years? The intelligence of a Grand Prix driver is like the layers of an onion. The more he has, the more he’s able to adapt to the ever-changing conditions of Formula One to edge out those other guys whose driving talents are all within one percent of his. Have enough layers and his name is Juan Manuel Fangio, Alain Prost, Ayrton Senna or Michael Schumacher. In a few years, we’ll see if anyone from the current generation has quite as many. Photo of Sebastian Vettel by Mark Thompson/Getty Images. Photo of Ayrton Senna by Michael King/Getty Images.